LILY LOLO Socket Line Eye Shadow Brush is perfect to apply dark mineral eye shadows for a defined and dramatic look ! Its thin short shaped bristles allows precise shading to the crease along the eyelid. Acclaimed by international makeup artists for their professional quality, Lily Lolo Makeup Brushes are made from synthetic hairs that's ultra soft and resistant. With this amazing makeup brushes line, even the most sensitive skin can forget about itching and scratching ! 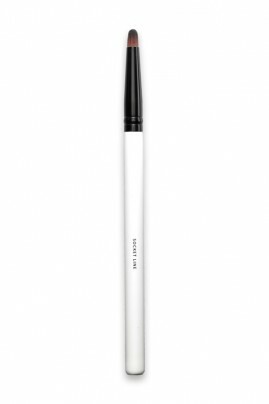 SMOKEY EYES MADE EASY BY LILY LOLO SOCKET LINE BRUSH ! 1. Lightly shake the jar of Lily Lolo Mineral Eye Shadow to get a small quantity of powder in the lid. 2. Take some of it with Lily Lolo's Eye Shadow Brush, Eye Definer Brush, Eye Blending Brush or Eye Detail/Smudge Brush, and tapp off the excess. 3. Apply the eye shadow on your socket line to add more definition to your eyes.